(NAPSI)—Before diving into yard care, make sure your lawn and gardening tools are up to the task with proper maintenance. The tips below could save you money and time by extending the life of your tools. To protect your investment in quality hand and gardening tools, clean them after each use, removing any dirt and debris. Then, wash and dry them, and lightly rub rusted areas with fine sandpaper. Pruning shears should be placed in a bucket with water and scrubbed with a wire brush until the metal is clean after each use. Coat the blades and moving parts with a water displacement lubricant with a controllable spray pattern, such as the non-aerosol WD-40® Multi-Use Product Trigger Pro®. Its narrow spray pattern will give you more control, eliminating overspray for less mess, while preventing rust from building up and helping shears open and close smoothly. Sharp tools make yard chores easier for you and help plants heal faster after a trim. Pruning shears, hedge shears and grass clippers function in a similar scissor-like manner. To sharpen them, tighten the pivot nut and file the edge of the pruning blade following the factory-cut bevel in single strokes until fresh steel is exposed. Check your power tools carefully for worn parts that may need replacement, and for loose screws, nuts or bolts. To stay in good condition, lawn mowers need yearly tune-ups. Protect the blades by coating them with WD-40 Multi-Use Product Trigger Pro’s wide spray pattern to help prevent rust, and dirt and debris, from sticking to the blade. Make sure your gardening tools are up for all tasks. 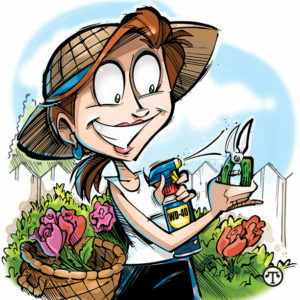 For more information about how non-aerosol WD-40 Trigger Pro can help make your gardening tool maintenance easier, visit wd40.com.